BioWare Lead Designer Emmanuel Lusinchi says The Old Republic studio needs to be "flexible and adapt to what's going on." Things have been going perhaps not quite as smoothly for BioWare's Star Wars: The Old Republic MMO as Electronic Arts had hoped. After charging out of the gate with 1.7 million subscribers in just six weeks, which EA claimed made it the fastest-growing subscription-based MMO of all time, the publisher revealed in May that the figure had dropped to 1.3 million. Shortly thereafter, layoffs followed. BioWare had previously insisted that subscriber numbers weren't falling but with the cat out of the bag, it now appears ready to take drastic action to turn things around, including, possibly, a switch to free-to-play. 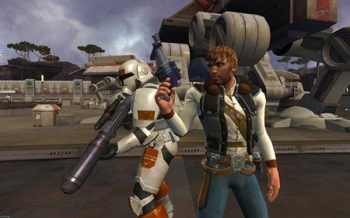 A number of other big-name MMOs have made the transition and Lusinchi suggested that they, as much as World of Warcraft, are putting the pressure on The Old Republic. 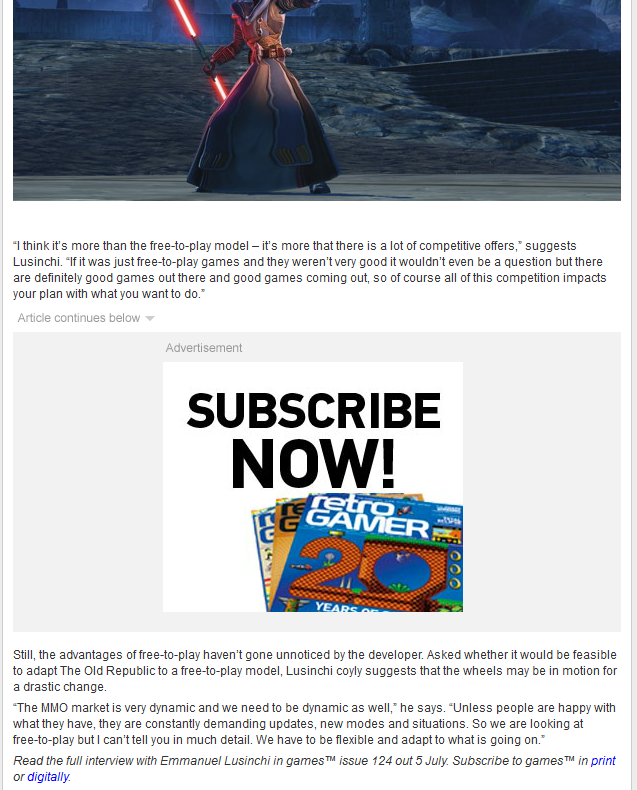 "If it was just free-to-play games and they weren't very good it wouldn't even be a question but there are definitely good games out there and good games coming out, so of course all of this competition impacts your plan with what you want to do," he told GamesTM. 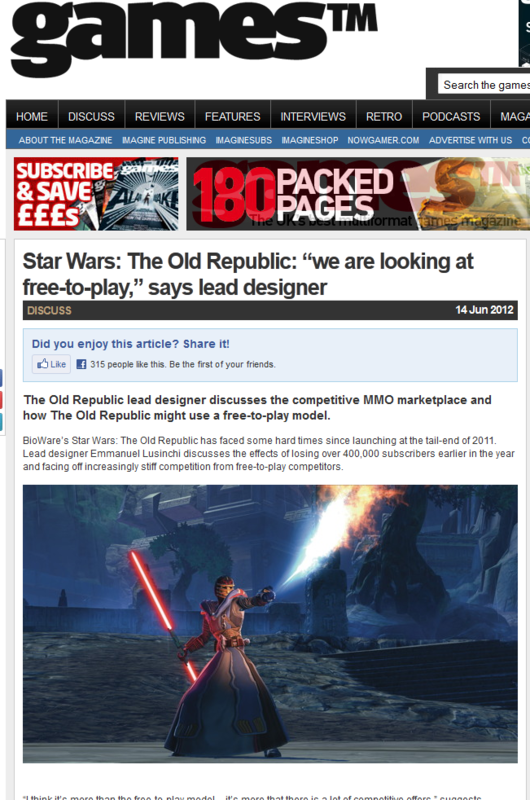 "The MMO market is very dynamic and we need to be dynamic as well. Unless people are happy with what they have, they are constantly demanding updates, new modes and situations," he continued. "So we are looking at free-to-play but I can't tell you in much detail. We have to be flexible and adapt to what is going on." Free-to-play is a perfectly valid and viable approach for MMOs to take, as evidenced by the post-F2P success of games like Dungeons & Dragons Online, Age of Conan and Lord of the Rings Online, not to mention the growing number of games that are built on the free-to-play model from the ground up. Even so, it'd be hard to see a changeover of a marquee game like The Old Republic, especially so soon after launch, as anything but a huge defeat and climbdown for EA. For some reason, the original interview with Lusinchi has been pulled, but fortunately Joystiq was able to dig up some scans, which can be seen here and here.